Boxed wine – technically known as ‘Bag-in-Box’ or ‘BiB’ because the liquid is actually stored in a metalised plastic bag within the box – has always enjoyed a ‘cheap and cheerful’ reputation, which has meant the wines were rather frowned upon by wine aficionados. The last few years have seen a number of producers attempt to break the stereotype, by boxing much more serious wines, whilst emphasising the advantages of this technology, and its eco-friendly credentials. The weight of a 5-litre box of wine is significantly less than the equivalent packaged in glass – 6.66 standard bottles. Its square shape also takes up much less room in a shipping container, so these two factors of weight and volume mean transport is more efficient, and the carbon footprint much smaller. The bags have a plastic dispensing tap on one side, with a one-way valve, so as wine is poured less oxygen is introduced than opening and pouring from a bottle, plus, the bag naturally collapses as liquid is removed forming a vacuum, which helps keep oxygen out and freshness in – BiB wines are reckoned to stay fresh for six weeks after first pour. A few high-profile French companies like Le Grappin are bottling decent Burgundy in BiB, Vinoteca in London sells a Crozes Hermitage from Jaboulet in a box, and the wine arm of St John Restaurant in London is bagging some excellent southern French wines. Now, an enterprising company called When in Rome is bringing very high quality Italian wines to the UK, available in either 2.25-litre (equivalent to three bottles) or 5-litre (equivalent to 6.66 standard bottles) boxes. Each wine comes from a small family producer and is bottled at the vineyard before being transported by rail to the UK. The wines are sourced and selected by Andrea Marchesi and Lorenzo Canali, Milan-based wine store owners (and Andrea a qualified winemaker) who use their extensive contacts in Italy to identify some truly interesting wines. I tasted the Friuli Sauvignon Blanc in the range, and was honestly surprised at just how good and expressive the wine was, but the small range includes Refosco from Friuli, Falagnhina from Campania, Barbera from Piedmont and Nero d’Avola from Sicily among a small but perfectly formed portfolio. When in Rome also invites you to join the ‘glitterati’ – actually a monthly club where a £29 subscription (can be cancelled at any time) sees a 2.25-litre box delivered to your door, as well as free re-fillable swing-top bottle, for you to bottle your own wine if you’d prefer not to pour straight from the box. I can think of no real downsides to the concept of wine boxes when the stuff inside is sourced with such care, and tastes so good. 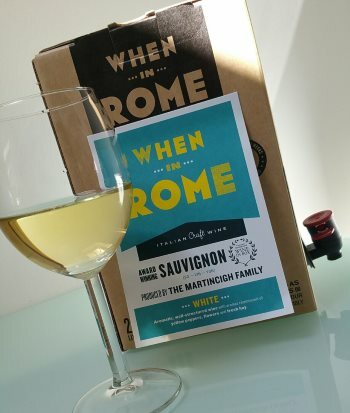 And the good news is that those attending my Edinburgh Festival of Wine can meet the people behind When in Rome and taste for themselves, to see if high quality boxed wine really is (part of) the future. I use cheap BiB wines expressly for cooking but drinking a glass or two while cooking is even better! Their Refosco,Sauvignon Blanc,and Nerod’Avola,are fresh, fruyity and well balanced. Excellent quality…with no rough edges!